ENGINE BUILDING is THE most detailed DVD ever produced on how to build pretty much any engine, from bone stock to mild performance. This double DVD set has 5 hours of information showing you every little detail and trick on how to build your own engine. It starts with the basics that so many other's skip over. You'll see a complete side by side build of a bone stock 350 Chevy and a mild performance 351W Ford with after market rods, pistons, aluminum heads, roller valve train, etc. All of the nitty gritty details of BOTH engines are covered. Once you see how two engines like these go together, you'll know how pretty much ANY engine goes together! You'll see all of the differences (and all of the similarities) from the machining process, to the parts chosen, to the clearances, to the final assembly. 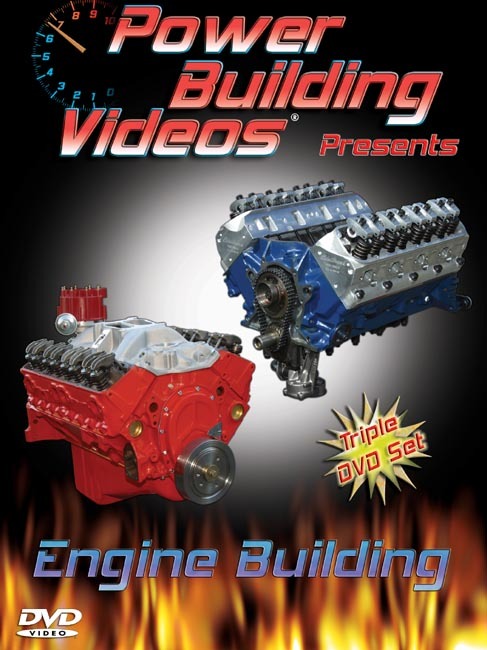 If you've wanted to learn how to build your own engine, whether it's a Ford, a Chevy, Buick, Olds, Mopar, a small block or a big block, then this is the DVD for you! Gain the knowledge and you'll gain the power. KNOWLEDGE IS HORSEPOWER!